Our range of products include erlonat 150 mg tablets and erlotinib 150 mg tablets. With our rich industry experience and deep knowledge, we are offering a qualitative range of Erlonat 150 Mg Tablets. These Erlotinib medicines are processed in compliance with medical standards & latest methodology using optimum quality ingredients. Our Erlotinib medicine is used for the treatment of non-small cell lung cancer (NSCLC), pancreatic cancer and several other types of cancer. Provided Erlotinib medicines are available from us in bulk quantity at nominal price within a promised time frame. 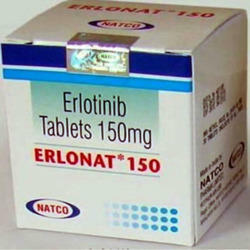 We are the prominent organization, indulged in offering a wide range of Erlotinib 150 Mg Tablets. Offered Erlonat medicines are processed by top quality ingredients in compliance with the set medical norms. These Erlonat medicines are tested in terms of quality for ensuring their quality. Also, our offered Erlonat medicines are available from us in various packaging options at affordable rates.